Sarginsons is a Midlands-based aluminium diecaster. The manufacturer was at the forefront of technology, but its online presence didn't reflect that leadership. The company therefore wanted a web presence and content that would showcase its range of diecasting capabilities, with an emphasis on its low pressure offering. 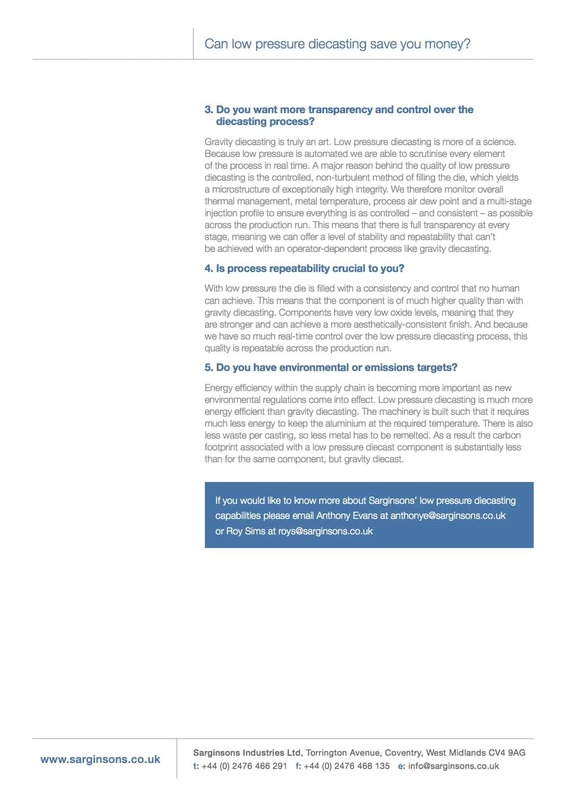 Low pressure diecasting was perceived as being expensive, and therefore the company wanted to change perceptions and educate its customer base about the benefits of low pressure over traditional methods. We started by creating key messages and brand values, which then became the framework for sales and marketing moving forward. This brand platform emphasised Sarginsons' longevity in the industry (it has an illustrious heritage) while highlighting its commitment to innovation. The strapline 'Pioneers in aluminium diecasting' encapsulated this position. We then used the brand platform to write new web copy that reinforced this message. Through discussions with Sarginsons, we decided that the company didn't have the resource - and the industry didn't require - a big investment in regular content. Instead, we decided to focus on writing one, persuasive article on low pressure that Sarginsons could use in sales and marketing, and adapt as required. 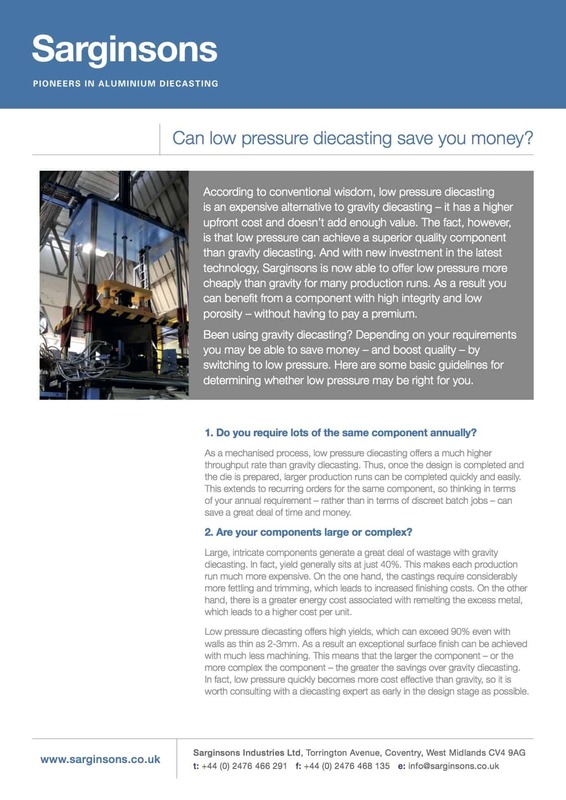 After a tour of the foundry and in-depth discussions with stakeholders, we wrote the article ' Can low pressure save you money?'. The angle was designed to combat the primary barrier to sale - price - and therefore give Sarginsons the greatest value. Low pressure has become an increasingly large portion of Sarginsons' order book. The content and new messaging has been incorporated very successfully into a wider marketing and social media campaign.